The screen will be thrown to the receiver lined up behind the line of scrimmage on the strong side of the field (for ease's sake, we'll call him the H receiver). The thing to note, however, is the alignment of Mississippi State's defensive backs: they were playing with this deep of a cushion the entire game, not to mention that the numbers are decidedly in Auburn's favor (3 vs. 3). This play ended up going for a touchdown as the playside linebacker came off the edge on a blitz, leaving Auburn with two blockers and two defenders. 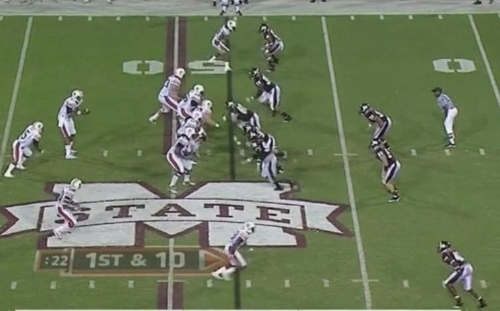 But primarily, this is just to show another example of (and attack plan against) Auburn's screen game. One of the more interesting plays is a screen/seam route similar to the Roundtree play-action that Michigan has shown this year. 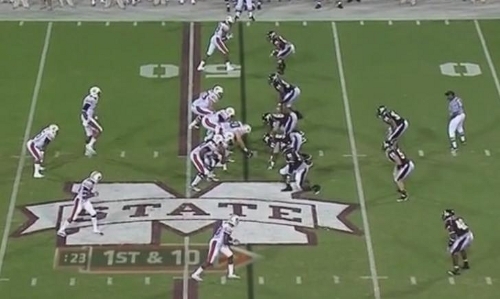 I posted this picture yesterday to show the weakness in Mississippi State's defensive alignment. 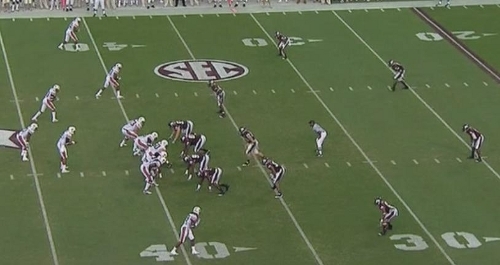 Auburn is in the 3x1 formation they showed for much of the game. 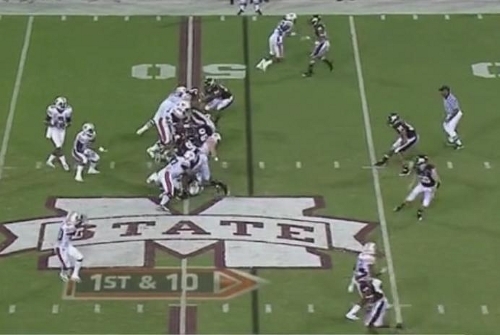 The Bulldogs are in their 4-3 (with stand-up DEs) and have a linebacker shaded over the slot receiver. With a 15-yard cushion between the line of scrimmage and the deep, strongside safety, this play is certain to be a screen (or at least have a screen option, as we'll see). (Sorry about the framing, the TV cameras panned in on the play.) 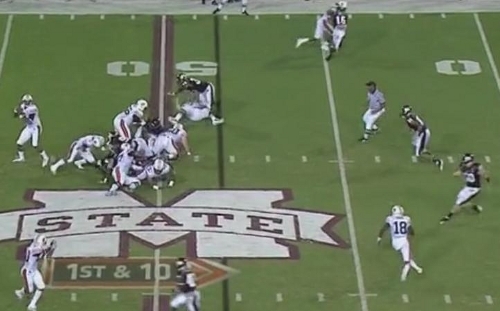 On the snap, Auburn runs a play-action. The H receiver is starting to bow out for a screen. The Y and Z receivers are both heading upfield. Rather than blocking the playside linebacker and cornerbacks, however, they'll both run vertical routes. When Newton pulls the ball down, his first read is the playside linebacker (bottom of the screen) who was lined up over the slot receiver. That linebacker is crashing down hard on the screen pass. The Y and Z receivers are running straight to the second level. I'm pretty sure the Y and Z receivers have a read here too: if the linebacker stays high, they probably stay in to block on the screen. If he crashes on the screen pass, they both run vertical routes. You can now see the playside linebacker headed directly for the H receiver. The linebacker will end up drilling him in the backfield despite the ball never going to the him. The Y receiver is curling under the middle linebacker five yards down field. The Z receiver is out of the picture but running a similar, deeper curl route underneath the strong safety. Newton recognizes it and is getting ready to throw. 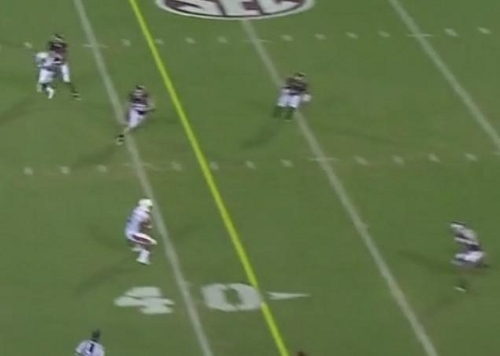 This is just after the Z receiver catches the ball. You can see he still has a seven-yard cushion from the strong safety and no linebackers anywhere near him. 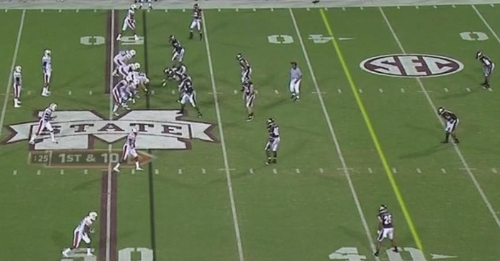 Mississippi State spent the entire game in this sort of coverage. Not only did they leave either the H or Y/Z receivers open, but they failed to compensate for this by aligning their defense in a way that would shut down the screen. Auburn frequently went to the 3x1 alignment and ran similar variations, almost always to resounding effect--save one time, which I'll discuss later, when Newton threw the screen pass to the H receiver despite the linebacker crashing really hard on the play, almost resulting in a pick-6. Possibly a lot. Despite a slight alignment shift by Auburn, this 3x1 formation and playcalling have become staples of Michigan's offense, except when teams schematically limit it (i.e., committing another defender to the strong side of the field). If Mississippi State is going to allow Michigan to throw these sorts of passes all game, moving the ball against their defense should be simple so long as Michigan's slot receivers can hold onto the ball (Roundtree...). This defensive alignment also gives a possible window into the disparity between Mississippi State's rushing defense (20th) and passing defense (89th): they simply sell out on the run. If that's the case, the ball will be put in Denard's hands and we have to hope he's fully healthy and making the proper reads. Then again, a Forcier cameo against this kind of defense would be ideal. Unfortunately though, this was the second game of the season. 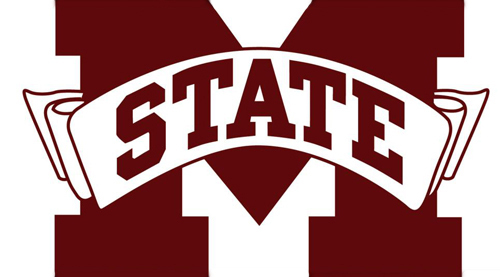 I'll be watching many of Mississippi State's games over the next few weeks and looking specifically for their defensive alignment against similar 3x1 attacks. If they don't show any shift in their defensive philosophy against similar looks, expect Michigan to go to this play and variations on it early and often. Not only will it net yards and keep their linebackers honest in the run game, but these are relatively safe passing plays in which Denard won't have to worry too much about making the right read.